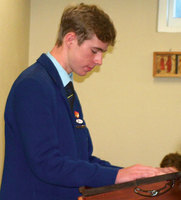 Three St Bernards, Lower Hutt, students won 11 scholarships between them last year. Abhishek Vadnerkar, pictured right with his parents, received five scholarships: chemistry, physics (outstanding – in the top 1 percent of NZ), science, statistics and modelling, and maths with calculus. Logan Ward, pictured, below right with his parents, won four awards for chemistry, physics, science and statistics and modelling, and Matthew Salter, below, received two scholarships: English, and biology. School principal, Peter Fava, praised the scholarship winners. ‘Congratulations to Abhishek Vadnerkar, Logan Ward and Matthew Salter. We are very proud of your achievements. We are grateful for the support of parents, the hard work of teachers and the commitment to study of our students. ‘We celebrate this accomplishment and acknowledge God’s hand in its achievement.